This is how the 40 million iPhones and iPod touches, a figure given by Apple at the WWDC Keynote, stack up against actual consoles. Even though the iPhone has the distinct disadvantage of being a platform that's not purchased just for gaming—pretty much every person who buys a PSP buys it to play games, for example—it's still a pretty damn huge market. Combine this with the fact that the faster graphics support in the iPhone 3GS is going to make it a pretty damn good gaming device, you've got a juicy target for game developers to hit. 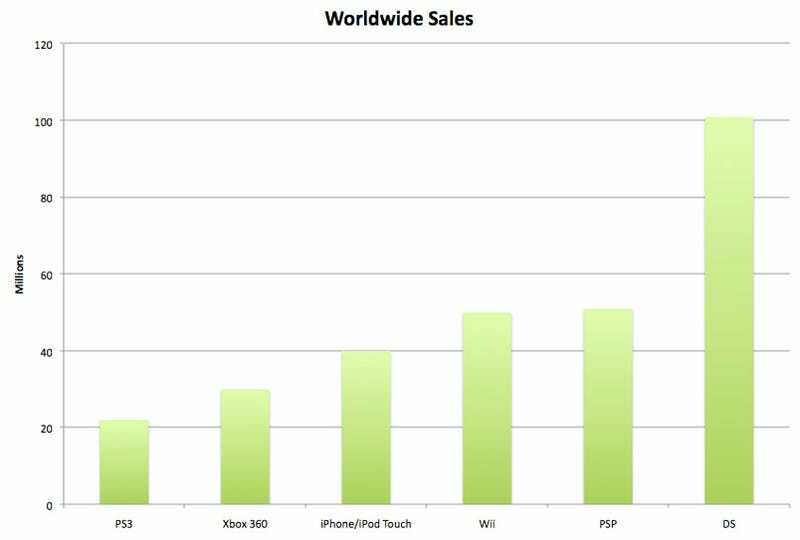 Note: sales data was taken from Wikipedia, and in some cases the figures are from as far back as March 2009. There shouldn't be a huge jump between March and May/June numbers, so it's close enough for the ballpark chart we're showing.